We work with early-childhood and literacy organisations to give away free books, which have been printed with funding from donors and sponsors. At giveaway events, we get to meet some of the children who’ll be reading our books. 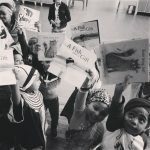 Get books to children this Mandela Day! 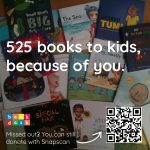 Update: 525 books! We are so humbled. The books are being printed and will go to the Santa Shoebox Project to be added to shoeboxes in time for the festive season! Book Dash is also throwing in an extra 3 575 books to the donation. Thank you to those who donated: Deb, Tarryn, Jon, Carla, Harriet, Lead, Duncan, Ingrid, Ester, Karen, Andrea, Janita, Michelle, Kristina, Yvonne, Brendan, Katie, Lauren, Aimee, Richard and Kelly. Book Dashers congregated at Jireh ECD Centre in Mitchell’s plain to hand out 750 Book Dash books to children. Each child got to take home three beautiful Book Dash books.